The Asset Triple A Awards are Asia’s preeminent recognition for institutions that have excelled in their respective industry and its Digital Awards is to select financial institutions and technology firms that have stood out in innovating and developing a unique digital experience for customers across the Asia- Pacific and Middle East regions. 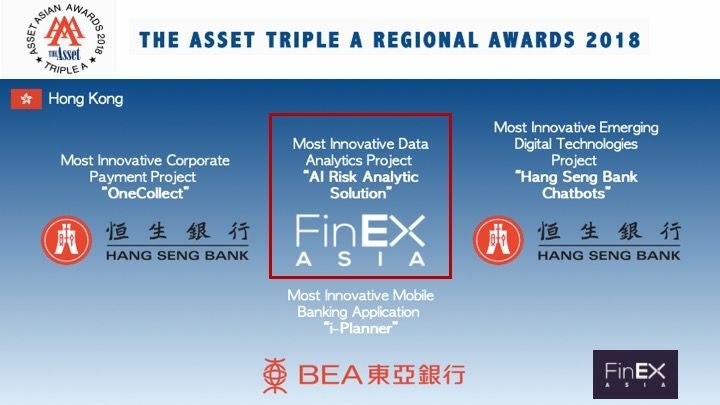 We are delighted to be recognized in the programme and awarded the Most Innovative Data Analytics with FinEX Asia’s AI risk analytic solution. FinEX Asia, through its proprietary AM analytic risk model, created the consumer lending fixed income asset class (“FinEX Asia marketplace credit fund”) for Asian investors. The AI analytic risk model enables FinEX Asia to cherry pick consumer loans from the US online marketplace platform and has utilized over half a million consumer data with over 150 million data points to train the model. Our AI risk analytic solution has a much stronger risk separation power, therefore the consumer loans that were selected by FinEX Asia Marketplace credit fund have a much lower default rate and it consistently generates 7-8% annualized returns with volatility less than 1%. The advantages in applying FinEX Asia’s risk solution in consumer credit have been proven by the performance of the fund and it is FinEX Asia’s intention for such model to be applied in more assets and more markets. The ability to discover attributes that cannot be identified with logistic regression models will benefit the investors in the long run. FinEX Asia Investment Limited (“FinEX Asia”) is a Hong Kong SFC licensed asset management company, which specializes in fixed income, alternative and private equity investments. Asset management is our core business. Combining our rich risk management expertise and advanced financial technology, FinEX Asia launched Asia’s first financial technology asset management platform. Through this platform, professional and institutional investors can access a series of FinEX Asia funds that are carefully structured through advanced risk modelling capabilities, and real- time performance monitoring.